PAWTUCKET, R.I. -- October 2, 2012 -- Today, Hasbro, Inc. announced Ian Williams, age 21 from Rochester, NY, as the winner of the "Official PLAY-DOH Artist of the Year" contest. Hasbro worked with the Rhode Island School of Design Sculpture and Ceramics Department, one of the top art and design schools in the United States, to offer students the exclusive opportunity to become the "Official PLAY-DOH Artist of the Year" and earn a $5,000 tuition stipend. 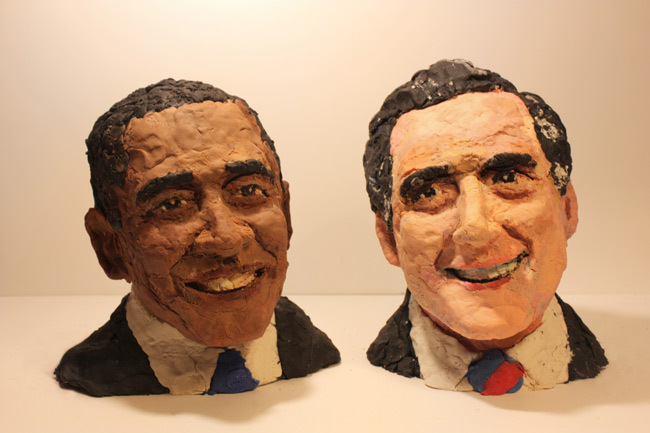 Each entrant sculpted both the Democratic and Republican Party 2012 presidential candidates, Barack Obama and Mitt Romney, using only PLAY-DOH compound. Entries were judged based on five criteria including realism, craftsmanship, creativity, presentation, and incorporation of the PLAY-DOH brand personality.